A journey of a thousand miles begins with….! The day we bought it, THAT journey is a story in itself! 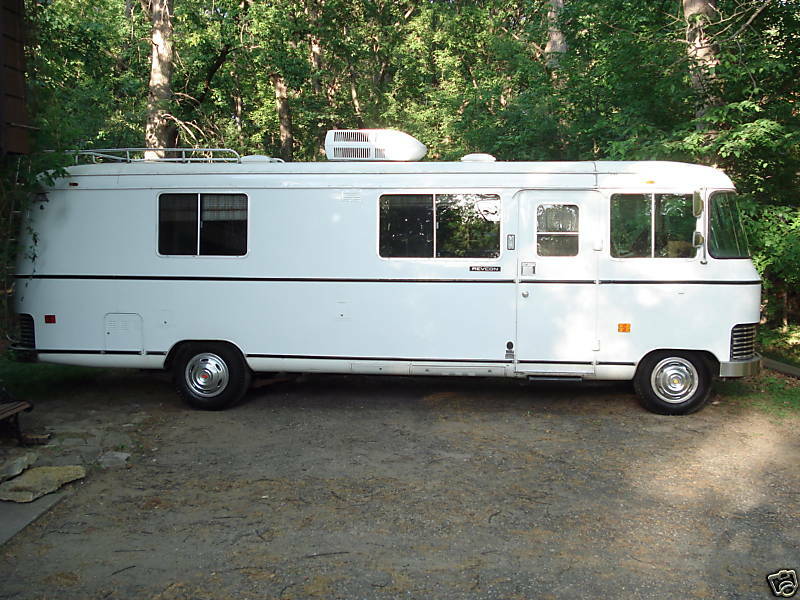 We have a 1976 Revcon Motorhome (The Mighty Revcon). The first exciting report will be updates on the Route 6 Tour. Starting June 3rd We join a caravan of classic trailers travelling across at least half of U.S. Route 6 in Pennsylvania with stops in several communities and campgrounds along the way. The tour is in conjunction with the centennial celebration of the RV industry. On Friday, June 4, traveling east on Route 6 from the Ohio line, the caravan will arrive at the Brookdale Family Campground in Meadville, near mile marker 24. An Open House will be held on Saturday from 1 to 4 p.m.
On Sunday, June 6, the caravan will travel to the town of Port Allegany in McKean County, between mile marker 159 and 160, for a community event including a “Walk Around” viewing of the vintage trailers and motorcoaches, participation in a car show and a meal. An Open House on Monday, June 7, will take place at the nearby Allegheny River Campground, Roulette, near mile marker 170 from 3 to 7 p.m.
On Tuesday, June 8, the caravan will travel to Galeton, near mile marker 198, where they will set up in the John J. Collins Memorial Park, right on the lake. An Open House will be held on Wednesday, June 9 from 1 to 4 p.m.
On Thursday, June 10, the caravan moves in Mansfield, near mile marker 234 and will set up in Town Park. An Open House will be held on Friday, June 11 from 1 to 4 p.m.
On Saturday, June 12, the caravan turns around and heads back west to Conneaut Lake Park and ends its stay in Pennsylvania. This will be fun. We will travel through you and Beth this time.